With the idea that the power of light might be utilized for purposes other than communications, Canare has long been tackling efforts to develop optical devices, even from the stage of actual light production. Devices range from semiconductor lasers and optical fibers through which the semiconductor laser light is coupled, to solid-state lasers that provide clearer and stronger light output. Canare is consistently trying to develop small 'engines' that may prove useful in a range of divergent fields in the future. These small, highly efficient laser light sources can excite and output light at desired wavelengths through changes in the materials used in their manufacture. 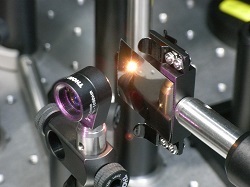 Owing to their high power output, it has long been expected that these lasers will find a wide variety of applications, including not only conventional optical communications and as optical pickups for recording mediums, but also in material processing, welding, medical services and measurement. These modules use optical lenses to efficiently couple light energy emitted from the semiconductor laser through optical fiber cables. This requires technology that directs as much of this light energy as possible into ultra-thin optical fiber cables. 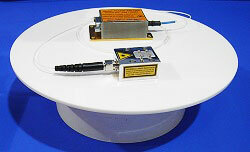 Absorbing light from the semiconductor laser, these lasers oscillate to produce light output at different wavelengths. 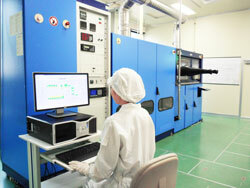 The output laser beam remains clear even if laser output is high. Solid-state lasers also feature the ability to accumulate energy and emit a powerful light output in a very short time, as well as converting absorbed light into light output at different wavelengths. To achieve this, technologies for coupling the excited light with laser light input, laser resonator optical design and waste heat discharge are required.